This is Deb from Kahakai Kitchen here with a bit about our current Cook the Books selection, “Like Water for Chocolate: A Novel in Monthly Installments with Recipes, Romances, and Home Remedies“ by Laura Esquivel. “Like Water for Chocolate” was one of the first “foodie” novels I read when it was published here in the U.S. in 1992, and it has remained a favorite of mine over the years. Apparently it has become a favorite of many others too, originally published in Spanish as “Como agua para chocolate” the book been translated into 30 languages and there are over three million copies in print worldwide and also a wonderful movie. For some of you it may be a new find and for others, rereading a classic, but regardless, I hope you enjoy the novel and the opportunity to delve into some Mexican culture and cooking. Set in Mexico in the early 1900’s during the time of the Mexican Revolution, the novel tells the story of Tita, the youngest daughter of a well-born rancher who falls in deeply love with Pedro, from a neighboring family. Unfortunately for Tita as the youngest daughter, family tradition dictates that her destiny is to remain single and care for her dominating, aging widowed mother, but she falls in love with Pedro anyway. Her mother quickly acts to stop it by making her sister marry Pedro, which he does to stay close to Tita. Tita’s only outlet for her passion and emotions is the food she cooks, causing those eating the food to experience everything Tita is feeling when they consume her food. It is a fun, fanciful and often poignant story of love, life and of course food, wonderful food! The book is divided into twelve chapters, one for each month and a recipe starts each chapter. The book itself is a great starting point for inspiration, or pull out your Mexican cookbooks (Rick Bayless and Diana Kennedy are wonderful sources). To join in the Cook the Books fun, all you have to do is read the book, cook up a dish or meal inspired by the story, and then post about it. (Don’t forget to leave a comment here or email me at debinhawaii@gmail.com about your entry so I don’t miss anyone), The deadline for this selection is Friday, March 26, 2010. After the 26th, I will post a roundup of your fabulous creations and a winning post will be selected. The winner receives a badge for their blog, will be added to the Cook the Books blog roll and of course will receive much honor and glory! Everyone is welcome so please join us! We look forward to seeing your dishes! “I’ve read through all the entries, and understand that some (most) might think that my perception was a bit rose-coloured… Of course, not every day or every person I met was great, but the book is a condensed recounting of over 10 years of travel, so the good people, the ones you tend to associate with an experience or a country, tend to stand out. I think another thing that contributed to my wealth of good experiences was the fact that I was often on a bike, so people feel like they need to take care of you. I’ve been on a few trips without the bike and there has definitely been less food offered! I guess when you’re on a bike, it’s obvious that you’re hungry… 🙂 So it’s a good match for those interested in the food of a place. Also, because I was on a bike so often, planning was almost impossible. I knew the direction I wanted to go, but that’s about it. Anything can waylay you when you’re on a bike – too many hills, or flat tires – and if you’re dead set on a destination at the end of the day you’ll invariably wind up disappointed. I’m convinced that I had many of these great experiences because I wasn’t dead set on reaching a certain place by nightfall (or because it simply wasn’t possible). I’m also convinced that if you go to a country with an open mind, people will open themselves up to you. Even post 9/11. Anyhow, I’m honoured to have been chosen, and thrilled that so many people decided to cook from the book. It was a tough call, but my winner is Foodycat, both for her effort and enthusiasm, despite her nervousness. And Foodycat, I use a rolling pin for my murtabak too! I think you have to do it for years before you get the wrist flick right. Best of luck to you all, and have fun with the next round – one of my favourite foodie books! Congratulations Foodycat, you join Claudia of Honey from Rock as our newest two-time CTB Champion! And thank you again to our gracious author and guest judge, Anik See. 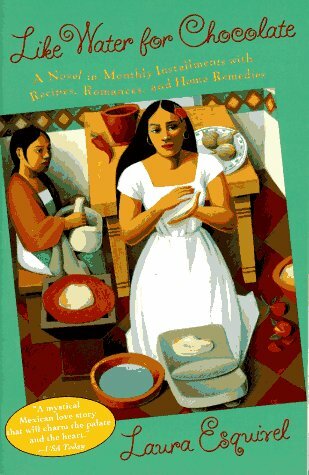 Now, I’m passing the torch over to Deb of Kahakai Kitchen for our next Cook the Books reading selection, Laura Esquivel’s “Like Water for Chocolate”. I can’t wait to dive into that book myself!